In a context of widespread migration, the arrangement and provision of social protection often takes place not within but across the borders of nation states. Social protection on the move, or transnational social protection, can then be consid-ered a product of the interaction between different systems: the social protection policies in the host country, the social protection policies in the country of origin, and migrants’ own practices and support systems. 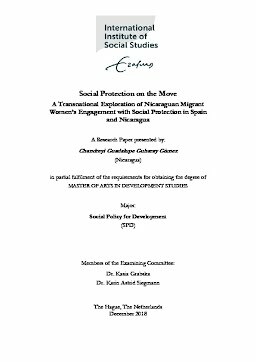 This research examines Nica-raguan migrant women’s engagement with transnational social protection in Spain and Nicaragua from a gender and intersectional approach to better under-stand how, in a transnational context, migrants mobilize resources and create strategies to access and provide social protection for themselves and their fami-lies across borders.